Jungle Red Writers: REAL MEN DON'T SHAVE--OR DO THEY? DEBORAH CROMBIE: Today we move from the sublime to the, if not ridiculous, at the least the very shallow. Has anyone else noticed the recent trend towards the absence of male body hair? It was very evident at the Olympics, of course--you won't see a stray hair on the manly chests of divers or swimmers or runners. Or, it seems, models or dancers or many movie stars. Not that I'm lamenting the days of the full fur rug sported by the likes of Robin Williams or Burt Reynolds (or the fake one worn by Steve Carrell in The Forty-Year-Old Virgin--ouch!!!) --but I've decided I miss seeing a little normal body hair on men. Oh, for the days of Sean Connery and Tom Selleck in their quite modest swim trunks! And now, having started noticing, I've become a bit obsessive. Does he or doesn't he???? My two most recent Nice Chest Hair awards go to Dominic West in The Hour, and Ewan McGregor in Salmon Fishing in Yemen. (Not that I wouldn't like either one of these guys with or without.) But they are brave about it, these smooth-chested (and smooth-thighed) blokes. Witness Channing Tatum here suffering for his art in preparation for Magic Mike. (Did I mention strippers in the above list of NO HAIR guys?) What about you, dear Reds? Do you prefer your men au natural? And would your fictional heroes wax for a good cause? HANK PHILLIPPI RYAN: I can't discuss this.I can't even think about this. I've NEVER thought about this. I am closing my eyes. I am closing my ears. La la la la la. HALLIE EPHRON: I never got what the big deal was about men's or women's chests... well okay, I sort of do. Okay, I get it. But men's chest hair? Don't swimmers get rid of it because it slows them down, or is that a myth? Same reason they don't wear boxers. What I do miss, though I know you didn't ask this Debs, are those halcyon days when women didn't have to shave, period. We pretended we were European. JULIA SPENCER-FLEMING: My first reaction was NO, but then I had to admit that there's a certain amount of manscaping that really improves the, shall we say, quality of my viewing experience. For instance: Nose hair, ear hair and eyebrows appearing anywhere on the face that isn't directly above an eye. Back hair. Ugh. Sorry, gentlemen of Mediterranean descent. I see men walking about on the beaches of Maine and all I can think of is "human shag carpet." DEBS: Hallie, I was never brave enough to go European. And obviously, that cultural trend has reversed itself. And Hank, you're too funny! For the record, Duncan would never wax--unless it would help him solve a case. What about you, readers? Are you embracing the smooth-men trend? And our guy readers--would you shave or wax? And would you tell if you did? My spidey sense told me there was a photo of Blond Bond, and there he is! My sons were swimmers and, in high school, they shaved their legs and arms if they made it to championships. The team had a head-shaving tradition, too, so in one night they went from hair down to their shoulders, to cue balls. The coach had each kid bend over a garbage can and he buzzed them right there beside the pool. I don't know if it helped their speed, since they all wore caps, but it was good for team spirit. I'm all in favor of manscaping. We have to do it, the boys should, too. But Tom Selleck is so adorable, he gets a pass. Never thought about it, don't really have an opinion one way or the other . . . but, oh my, that is a great picture of Tom Selleck. LordAMercy - What a versatile, well-rounded group this is! Curiosity abounds (and that's a good thing). 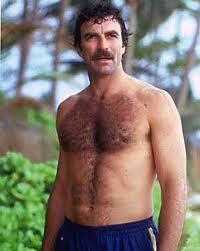 Now, back to looking at that picture of Tom Selleck (yes, I prefer a bit of chest hair). I second Joan. Great photo of Tom Selleck! Huh. Oh, yeah; you asked a question, didn't you? I have no preference. At the gym I HAVE noticed the absence of underarm hair and leg hair on a lot of the men. Not that I spend a lot of time gawk-,uh, staring. I go there to exercise. And really? Hair? Some people just naturally have a lot of it, and some do not. It isn't a personality flaw to have it or not have it. If people want to remove it,let them...but I don't really care. I wish that we ladies could get a "pass"on it! Think of all the things we could have done with the time (and in many cases, money)we have spent on hair removal in our lives! Now I'm going to look. Ah, ah, ah. Yikes. Closing eyes. Okay, metaphysical question: Why do so many men's heads go bald and their eyebrows get bushier? Manscaping?? Ramona, you're hysterical. Debs, you are hysterical too! Hank, so you don't feel bad, I wrote Debs yesterday offline and said: "I have nothing to say about men's chest hair." Oh, too funny! I'm still laughing about the "front yard." I love this site! One learns sooo much. I didn't weigh in earlier because I was at the US Open all day where I'm fairly sure Roger Federer has THE perfect distribution of chest hair. I can also remember Andre Agassi's shirt flying up and thinking..hmmm, that's nice! Too smooth always meant "look at my pecs!!" to me, which is fine if you're Ryan Lochte or Michael Phelps but less fine for most mere mortals. Hear, hear, Steve! "Vain, and trivial, and silly." Yes, my feeling, precisely. If a man is spending that. much. time. shaving all the hair from their bodies? Egads, that's more than a little self-involvement, and it's too much so for my tastes. 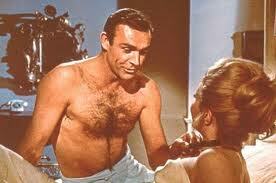 Besides, I quite like a bit of chest hair to fondle during intimate moments. Also still laughing over the front yard and the shrubbery. And Ramona's spidey sense, of course! Vain, trivial, and silly, AND it grows back! A chest with "five o'clock shadow"? Oh, my, shaving the shrubbery! I am laughing way too loudly in my cubicle. Whatever hair a person has, I say keep it. Men and women. That's my position and I'm sticking to it. Everybody's talking about how "vain and trivial and silly" men are who remove hair for cosmetic reasons. Women aren't? You all are making me laugh so hard I snorted my tea! I'm with Julia on the nose hair, ear hair, and eyebrows anywhere other than above the eyes. And Hallie, I think "why do eyebrows get bushier as heads get balder?" is one of the great existential questions. And Edith, chest hair stubble! Acckkk! That never never would have occurred to me. But I'm with Steve, and Karen, and maybe the general consensus: A man who even notices he has too much chest hair, let alone takes the time to actually shave it, is too self-involved for me. That said, I understand why they do it on TV. It's just another form of airbrushing the human form so that we can long for a perfection that doesn't exist in real life and buy products to that effect. Just please God, don't let it catch on! I've got two words for you: Benedict Cumberbatch. When he was undraped in the Belgravia episode of SHERLOCK, I have to say I couldn't take my eyes off of his lovely smooth chest. Until I starting staring at his lovely smooth backside, but that's my problem! I think manscaping is a good idea for many men. Some even need to trim their underarms! I once sat next to character actor Donald Moffat in a theatre (look him up if you need to, you've seen him in many movies) and if I had had a pair of cutible scissors with me, I would have held him down and tidied up those bushy brows. One of the best things about men is they are different from me! I like big hairy guys. : ) I married one! I think the new fashion of the lack of hair on men's bodies is just catching up with the old fashion of lack of hair on women's. All the better to make us look like statues or children. I think it's ridiculous to make men shave or wax their bodies, just as it's ridiculous to make women do it. One of the great things about menopause is loss of hair on the legs, so no more shaving. I have to say, nice as Daniel Craig may look here, he's not a patch on Tom Selleck or Sean Connery. But then I've noticed that, lately, the male heart throbs tend to look more like sullen teens than in the day of Connery and Selleck. How about Alec Baldwin in Working Girl - va-va-voom! Tom Selleck, in his day, was one gorgeous, hairy guy. His legs - yesss! Eyebrows at least are expressive. I've never seen chest or shoulder hair (no one's mentioned shoulder hair) that offered a single opinion. I'm certainly not turned on by the human ape look and back hair... ugghh. But a little chest hair looks natural. But what's this with the unshaven look. My son sports it.. not a beard but the escaped convict look. I see it on a lot of sports stars etc. Rhys, two words: Grover Norquist. Gaaack. Hallie, I was thinking about shoulder/back hair, but decided to let that one lie there, unnoticed. On women shaving "everything": It solves that little problem of the carpet not matching the drapes. But it's still creepy to me. And I can't IMAGINE going to an aesthetist to have my unmentionables denuded. Yikes. Karen...a friend's daughter likes to have the Unmentionables waxed. Unfortunately,it has led to infected ingrown hairs in "that region", which means she sees a dermatologist,etc. "Manscaping" -- great new word! I love men with hair. The men in my life, except for the occasional Buddhist monk, have always had lots of it. The competing cultures in my family, though, never approve of one or the other: "His hair is beautiful. So long and respectful." Or: "Can't you get him to cut his hair?" I would never shave my chest hair. It took 40 years to grow one. Bummer, I missed a great conversation! Excess hair in strange places (or even the normal places) isn't the best. But I don't get why on screen it's apparently taboo to have any chest hair at all. It seems strange to me. And weird: That Tom Selleck picture? I'm so used to seeing hairless men on screen that he seemed hairy to me! What a shame, I say. It's like when you see old films and you notice regular teeth on the actresses (Ingrid Bergman for example) only they seem like "bad" teeth because we're so used to pure white porcelains. 26Aughh, Ladies, if I may interrupt. As a 65 year old hairy man I have in recent years pondered this subject. Until about 10 years ago I never for a second thought about the hair on my chest or back. Then my daughter said something at the beach and I found out that younger gals didn't like that kind of hair. Found it gross. Since I was already usually invisible to women under 35 , that younger perspective didn’t concern me. About 8 years ago an attractive woman in her mid-forties I knew who was an esthetician was staring at me on the beach. As an athlete and someone who worked out and stayed in pretty good shape I just assumed she was admiring my physique(Years before, okay many years, when I was a tennis pro, several of my female students had commented on my shapely legs.) The esthetician was panting and drooling like someone who had just found buried gold bullion. I blushed, proud that I still had sway over the ladies. The blush was a little premature. It seems that she had just gotten into laser hair removal and I was such a treasure that she offered me $10,000 worth of treatment for free if I would let her practice on me. I like a good bargain, but I didn’t want to be her test site. Four years ago my cousin’s 50 year old beautiful wife told me she would like to shave off the hair on my chest and back so I would look as great as my tan hairless cousin. Just thinking about her shaving me had its perks, but again I declined. I have to admit, with all these women wanting my hair removed,I do tend to put on my shirt right after swimming. I rationalize that it’s because of the sun and skin cancer but I know that if my daughter had never made that remark, I would chance a little more exposure. Today, knowing I wanted to comment on this subject, I asked my lesbian masseuse her opinion, figuring if anyone had the right to be grossed out by a man’s hair it was her. She said she had never thought about it and it was a non-issue. I immediately invited her to go for a swim. Andrew, you are a prince, and should be appreciated just as you are. I'm sure all the ladies here will whole-heartedly agree! Lisa, you still see British actors and actresses who don't have perfect teeth. I love it. Makes them look like real people. Lisa, you're so right. Movies, TV, and advertising are trying to make normal human beings look (and feel) like something's wrong with them. Like the stick-thin models that they go on to photoshop by stretching and airbrushing to make them look even thinner. Or the beautiful women of color they photoshop to make them look whiter. Hairlessness. Gorgeous fake teeth. We're coming to the point where normal human appearance looks "off." Jack, I loved yours. I choked on my water while reading it. Reine, I hear you on the conflicting cultures. In Latino, Cherokee, and Choctaw cultures, long hair on men is usually a sign of a man who is deeply involved with his culture and its spirituality. In mainstream culture, long hair on a man is a different kind of sign altogether. 3rd time trying Captcha. A sign that I probably shouldn't be posting this. I had a younger bf for a while and he was all about trimming - even waxing for back hair that was starting to grow. I prefer smooth, but if you're in love - it doesn't matter! Back hair is gross, but I think it's extremely weird for men to wax any part of their body. I'd never wax anything on my body and I think women who do are torturing themselves. I also think it's kind of weird for men to shave off body hair, but sometimes it looks better with less hair. If they shaved their underarms their deodorant would work better.